IN BEAUTIFUL KENT. The Continental Express, near Hildenborough, on its daily journey between London and Dover. OF all the throngs of passengers to be found on any station platform in the world, that on the main departure platform at the eastern side of Victoria Station, between half-past ten and eleven o’clock in the morning, is among the most cosmopolitan. The time of departure of the “Golden Arrow” is drawing near. To many passengers Paris will be but a stepping-stone to more distant places-to the Riviera, perhaps, or to the Alpine regions of mid-Europe; or, again, to the Near East by the Orient Express, or to Marseilles to catch a fast liner tor Egypt, India, or the Far East. Because of all these possible destinations, to which the “Golden Arrow” forms the first link in the chain of communication, the crowd of travellers is essentially a mixed one. Traffic from London to Paris was at one time the subject of fierce competition between two competing railways - the old London, Chatham and Dover and the South Eastern. Both ran from London to Dover, to connect with the Calais boats; and the South Eastern, in addition, had services from Folkestone to Boulogne. Fast running, for those days, was made by the two competitors. The London. Chatham and Dover ran from Victoria and from Holborn Viaduct, joining the two portions together at Herne Hill, and thence without a stop over the severe gradients through Chatham, Faversham, and Canterbury to Dover. The South Eastern started from Charing Cross. Once its trains were over the summit at Knockholt and down to Tonbridge, they had a straight and comparatively level course through Ashford to Folkestone and Dover. Later, an amalgamation brought the South Eastern and Chatham Railway into being, and the one company then developed the traffic from London to the Continent. An even more comprehensive grouping followed in 1923, when the London and South Western and London, Brighton and South Coast lines joined the South Eastern and Chatham to form the Southern Railway, which now controls, on this side of the water, all railway services between England and France. Of all the continental trains now running on this service probably the most famous is the “Golden Arrow.” It is known all over the world. When the “Golden Arrow” was first introduced, an all-Pullman train was provided on either side of the Channel, ten large cars, first-class only, being run. 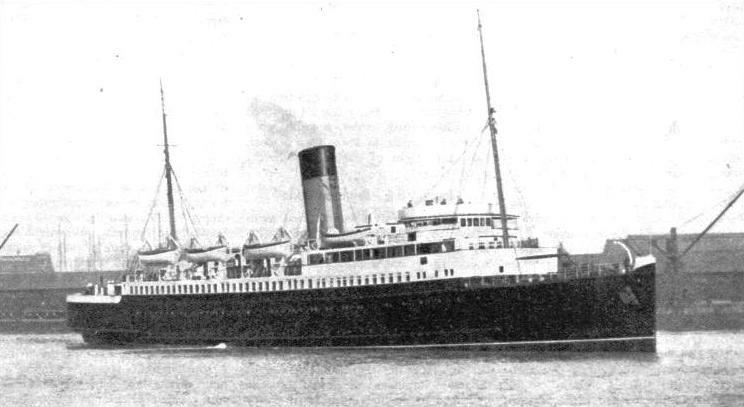 A special steamer, the Canterbury, was built exclusively as a connecting link. But a phase of depression in cross-Channel traffic followed the devaluation of the pound. Since then, although the number of passengers crossing the Channel has again increased, the conditions - including the growing competition of cross-Channel air services - compelled the “Golden Arrow” to abandon its exclusiveness. The first-class barrier was banished and second-class coaches were included. The first noticeable feature of this train is a long truck at the rear end, carrying a row of large boxes, securely fastened to the wagon with chains, and with wide-open doors fronting the platform. This is for “registered” baggage, specially labelled through to destinations abroad. Baggage thus registered crosses all frontiers, save the final one, without customs examination. Much unnecessary handling is thereby saved. Apart from two or more vans, also filled with baggage, there are the first-class coaches and, beyond them, the Pullman cars. On the English side of the journey, four to six first-class Pullmans only are run. Two of the Pullmans contain kitchens. Ahead of the Pullmans are the second-class coaches, some of them beautifully furnished open saloons of the latest Southern Railway type. They are known, somewhat inappropriately, as “nondescripts”, since they can be used at will as second-class or first-class cars, which is obviously much to the advantage of the second-class passenger. At normal times the train thus consists of about five Pullmans, weighing some 40 tons each, five or six ordinary coaches, weighing 32 or 33 tons each, two vans. and the truck with the luggage-boxes, the total weight (empty) being from 400 to 440 tons. 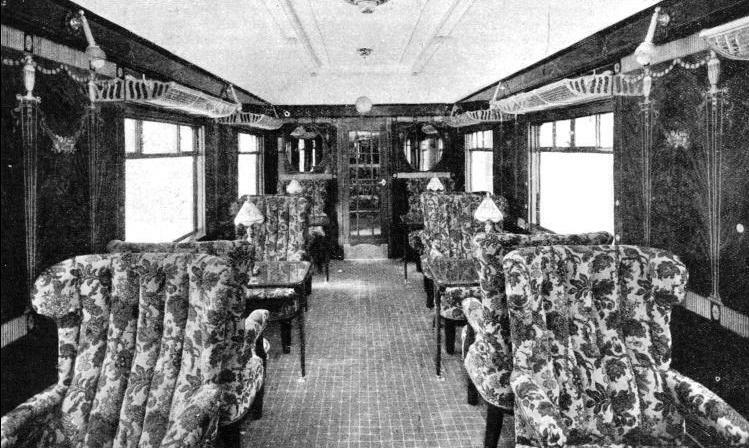 ARMCHAIR ACCOMMODATION is provided for each traveller in these Pullman coaches of the “Golden Arrow”, which is hauled by a locomotive of the “Lord Nelson” class. At the head of the train will be found one of the fine four-cylinder 4-6-0 locomotives of the “Lord Nelson” class, all of which are named after famous British admirals of past days. A certain number of these engines are stationed at Battersea locomotive shed specially for working the heavy Continental expresses between Victoria and Dover. These are the most powerful express engines in use on the Southern Railway; they have four cylinders 16½ in diameter by 26 in stroke, 6 ft 7 in driving wheels, and a working pressure of 220 lb per sq in. Each engine of this class has a weight of 83½ tons in working order. With the addition of an eight-wheeled tender, holding 5,000 gallons of water and six tons of coal, the total weight of engine and tender is 140 tons. On the stroke of eleven the last goodbyes are said, the driver opens his regulator, and the seventy-seven miles run to Dover has begun. The extremely rapid puffing of the engine may at first occasion some surprise. This is due to the fact that, instead of all the four cranks being fixed at 90 degrees apart, dividing up the circle into four equal parts, two of them have been advanced through 45 degrees, so that eight separate impulses are given by the cylinders to the driving axles in every complete revolution of the driving-wheels. There are therefore eight exhaust beats, or puffs, to a revolution, instead of the more usual four of a four-cylinder engine, the exhaust beats of which are thrown out in pairs. The aim of the “Lord Nelson” arrangement is to give a more even torque, or turning moment, to the driving axle, and a more regular draught to the fire. The line rises at 1 in 61 out of Victoria on to the Grosvenor Road Bridge over the Thames. With a train of such weight as the “Golden Arrow” assistance is necessary, not so much to prevent the express engine from “stalling” on the incline, as to get the heavy train clear of the section as quickly as possible. So the tank engine which brought the empty coaches into the terminus pushes helpfully in the rear. When the bridge is reached the tank engine is released. Meanwhile the all Pullman “Brighton Belle”, which has left the other side of Victoria terminus at the same moment, has probably passed the “Golden Arrow”, thanks to the better acceleration provided by electric power. Once across the Thames, the “Golden Arrow” gathers speed, but many miles must elapse before high speeds can be run. This particular exit from London is a difficult one; it entails mile after mile of almost continuous climbing until Knockholt has been passed. First comes the two mile stretch, mostly at 1 in 95, from Herne Hill up to Sydenham Hill; then, after the express has plunged downwards through Penge Tunnel under the Crystal Palace, speed must be reduced over the curves past Kent House and Beckenham. At Shortlands climbing begins again at 1 in 100 for three miles up to the junctions at Bickley, then round the curves up on to the old South Eastern main line at Pett’s Wood; and then on flatter gradients, but still steadily upward, until at last, 18½ miles out of London, Knockholt summit has been breasted. Further complication is caused by the fact that the “Golden Arrow” has so far had to take its turn in a busy electric train service that calls at all stations and uses the same tracks. OUTWARD BOUND. Immediately the passengers arrive at Dover they embark on a cross-Channel steamer for Calais. This picture shows the Canterbury steaming out of Dover Harbour. A tempting downhill stretch lies ahead. Through Polhill Tunnel, over a mile long, the train swings down to Dunton Green, probably attaining about sixty-five miles an hour before the short ascent to Sevenoaks - where electrification is finally left behind - is rushed, and up to the mouth of Sevenoaks Tunnel. This bore, under the chalk downs, is the longest on the Southern system - just over two miles in all - and is one of nine tunnels on the journey, four of which are more than a mile long. The descent is now steep, 1 in 144 through the tunnel and 1 in 122 beyond, and speed may rise to seventy-five miles an hour - or possibly even to the “eighty” line - before the brakes go on for the sharp curve into Tonbridge Junction. At a fraction over fifty miles from Dover, the time remaining in which to complete the journey is probably little, if at all, more than fifty minutes. But the rest of the course is admirably suited to high-speed running, with modest gradients, and, so far as Great Britain is concerned, unique in its perfect straightness of many miles, across the Weald of Kent. So the “Lord Nelson” can devour the miles at fifty-five seconds apiece, or less, hurrying on the way through Ashford, and past the locomotive works - one of the two principal locomotive-building centres of the Southern Railway - to Sandling. From here the line is all downhill to Dover. Folkestone is passed at speed, and from the high viaduct over the town passengers get their first glimpse of the sea. The train speeds through the Warren - that region of gradually eroding cliff and landslide which has given the railway authorities so much trouble. Before entering the long tunnel through Shakespeare’s Cliff, the passengers may catch sight of the workings for the Channel Tunnel, the boring of which was begun, but discontinued, many years ago. A short stretch of line along the beach at Dover, curving sharply round to the right, and then the Dover Marine Station is reached - a fine modern station which some years ago replaced the inconveniences and discomforts of the old station on the Admiralty Pier. The journey of seventy-seven miles occupies ninety-five minutes. A shunting engine seizes the luggage vans and works them quickly round to the quay, where the steamer Canterbury is waiting. The chains securing the luggage-boxes to their truck are undone, and cranes swing the boxes bodily round and down into the ship’s hold, thus doing in a matter of seconds what might have taken many minutes were each article of luggage transferred by hand. The contents of the vans are piled on to large trays, which are swung aboard with equal rapidity, and not more than twenty minutes usually suffice to empty the contents of the train, passengers included, into the ship. Five minutes to one is the scheduled time for the Canterbury to cast off. The Channel crossing need not be described at length, as we are more particularly concerned with the railway features of the journey. Once clear of the harbour at Dover, our comfortable steamer rapidly forges her way across, the chalk cliffs of Kent gradually fading away behind us, while the high coast-line of France, culminating in Cap Gris Nez, looms up ahead. The towers of Calais appear over the bows, and the Canterbury turns stern first in order to enter between the two long breakwaters into Calais Harbour. The French “Golden Arrow” is waiting alongside the quay. It was, in fact, the title of the French train that gave the name to the service. Various intriguing titles have been found for the French Pullman services, such as Etoile du Nord (North Star) and Oiseau Bleu (Blue Bird) for the all-Pullman non-stop expresses between Paris and Brussels, which were both preceded, however, by the Fléche d'Or, or “Golden Arrow,” between Calais and Paris. Arrows of gold are painted on the sides of the Fléche d'Or to give a touch of realism to the title. When the “Golden Arrow” was first introduced and the train consisted of only Pullman cars, the weight was over 500 tons. The train now consists of only five or six Pullmans, which are sufficient to hold first- and second-class traffic. 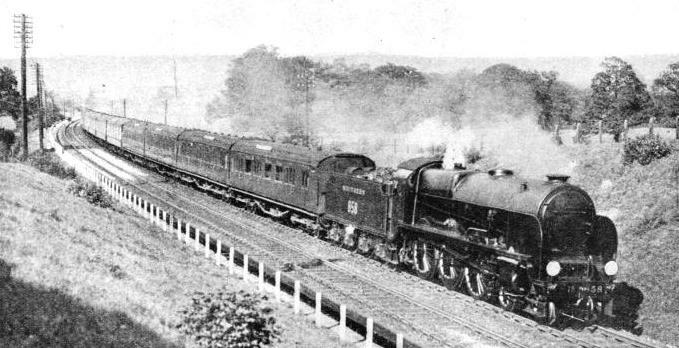 Formerly two trains left Victoria, one for ordinary passengers following the “Golden Arrow,” and a second steamer for the non-Pullman people followed the Canterbury. A collection of three expresses then made its way out of Calais - the “Golden Arrow” first, a train composed entirely of sleeping-cars, and the restaurant car express for the ordinary passengers, all three making a non-stop run to Paris. The Fléche d'Or standing on the quay at Calais is almost a symphony of brown, cream, and blue-brown and cream Pullmans in front, and blue sleeping-cars at the rear. One or two of these cars form a part of the celebrated “Blue Train”, and on arrival in Paris are worked round from the Gare du Nord to the Gare de Lyon, there to be attached to the “Blue Train” proper-an express made up entirely of first-class sleeping-cars carrying holiday-makers to the Riviera. Another “sleeper” is labelled “Rome,” and is attached at the Gare de Lyon to the equally famous Rome Express - a train of first- and second-class sleeping-cars which passes through the Mont Cenis Tunnel on the way to Turin, Genoa, Pisa, and Rome. Continental rolling stock, in comparison with British, is very heavy; a restaurant car weighs 54 to 56 tons, a sleeping-car almost the same amount, and a Pullman car 48 tons, or up to 54 tons if a kitchen is included. Nine or ten of these great cars, and a van or two, will therefore total, with passengers and luggage, to something like 600 tons - a formidable weight to whirl to Paris at an average speed of 58.4 miles per hour. In the reverse direction the schedule is five minutes less - 185 minutes as compared with 190 minutes - and the average speed demanded in the latter instance over the 184.1 miles is all but a mile a minute. This arouses curiosity concerning the locomotive about to perform so herculean a task without assistance. From the ground, as there are no platforms to detract from its size, the engine seems to have excessive height; but the French have more space above rail - 14 ft 2 in in all, to be exact - in which to build than we have in Great Britain. 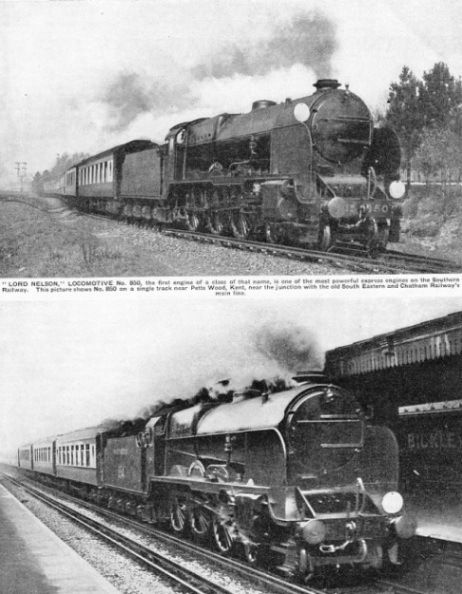 Further, the French engine’s weight of 96 tons is practically identical with that of one of the later high-pressure “Pacific” engines of the London and North-Eastern “Flying Scotsman” type. The French locomotive is, similarly, of the 4-6-2, or “Pacific” wheel arrangement - that is, with a leading bogie, six-coupled driving wheels, and a pair of carrying wheels under the cab, which permit a more generous development of the firebox than would otherwise be possible. 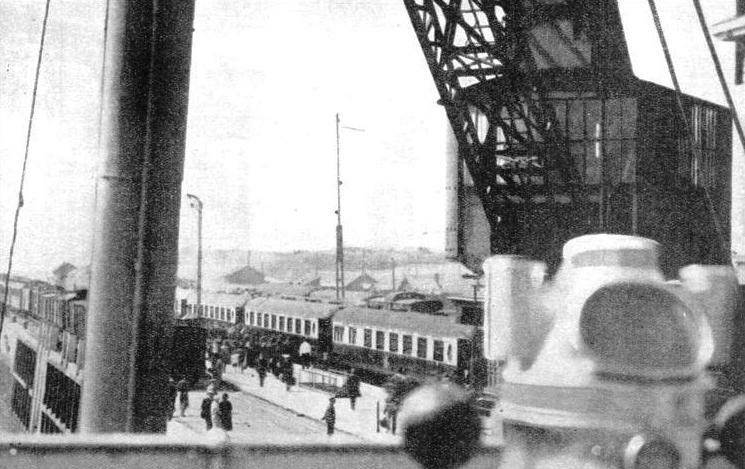 AT CALAIS the passengers are transferred to the Paris Express, seen here on the quay of the Gare Maritime. On the sides of the Pullman cars are painted arrows of gold. Some of the sleeping-cars form a part of the celebrated “Blue Train” which runs from Paris to the Riviera. One of the sleepers, labelled “Rome”, is attached at Paris to the equally famous “Rome Express”. To British eyes the first appearance of a French locomotive comes as something of a shock. It seems to carry a large proportion of its internal economy spread in the form of parts of various shapes and sizes, pipes, and rods, all over its exterior. Appearance is obviously a secondary consideration; but it must be conceded that these various parts are more readily accessible, for maintenance and repairs, than when they are stowed away somewhere inside the locomotive. The Northern Railway of France, or “Nord” for short, has four families of “Pacifics”. All their numbers start with the figure “3”, indicating that the engine concerned has three driving axles coupled. There are, first of all, three successive developments of the original “Pacific” series, each larger and more powerful than its predecessors. The fourth series, however, is altogether different. After long and patient research, the Paris-Orleans Railway of France rebuilt certain of its earlier “Pacifics” with new and enlarged steam pipes and cylinders, double blast pipes and double chimneys, and various other improvements designed to permit the steam to flow as freely and as quickly as possible from the boiler through the cylinders to the chimney The effect on efficiency and on performance was startling. So much so, indeed, that, as a number of the Paris-Orleans “Pacifics” are no longer needed on that system, owing to the extension of electric working, they have been rebuilt on the same lines as the experimental engine, and bought by other French railways. The Nord is now in possession of twenty of these Paris-Orleans conversions, and they are doing magnificent work on the Nord system. To make the “Golden Arrow” journey in an appropriate Nord atmosphere, it may be assumed, as is most probable, that the engine at the head of the “Golden Arrow” is one of the third series of Nord “Pacifics” - or “Super-Pacifics”, as these later engines are generally known. This locomotive, in accordance with general French practice, is a “compound”; that is to say, steam is conducted direct from the boiler to two cylinders outside the frames, known as high-pressure cylinders. After having been carried in them through the first stage of expansion into a second pair of cylinders between the frames - the low-pressure cylinders - for a second stage of expansion, the steam is finally exhausted from the chimney. French drivers are artists in the manipulation of their two independent sets of valve-motion - high pressure and low pressure - to secure the best possible results from their engines. But the training of drivers goes farther in France than it does in this country; every French driver, for example, serves for two years as a fitter’s helper, and in this and other ways the French mécanicien is fully qualified to handle the complicated locomotives put in his charge. The size of the tender calls for comment. This is because sufficient water must be carried for the 184-mile non-stop run from Calais to Paris, with this weighty train, track-troughs not being in use on any Continental railways, with the sole exception of the French State Railways. The water-tank in the tender is therefore exceptionally capacious. Above it may be seen two kinds of fuel-first of all, briquettes, or rectangular blocks into which small coal has been forced under pressure, and the remainder, mostly “slack”, or an inferior class of fuel which would find no favour in locomotive firing in Great Britain. The briquettes are used when special demands are made on the boiler for steam, and the slack throughout the remainder of the journey, thrown by the fireman into a great cavern of a firebox, between 11 ft and 12 ft long. The work of these locomotives is all the more amazing in view of the type of fuel with which they are fed. THE PARIS EXPRESS. 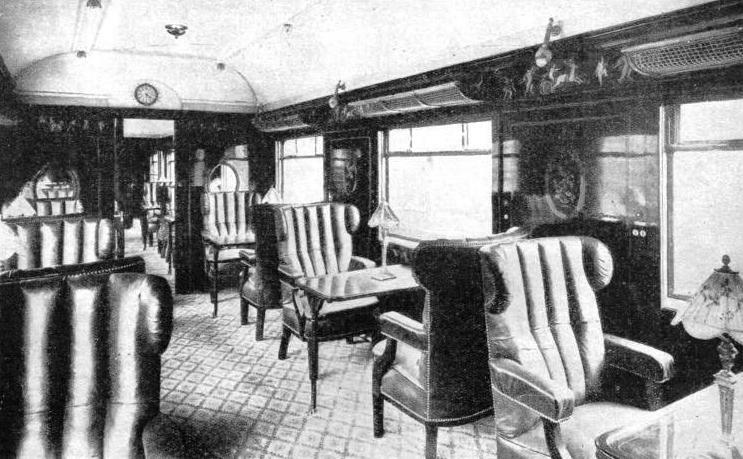 An interior view showing the accommodation provided on the Pullman cars in service between Calais and Paris. Forty of these de-luxe coaches were recently built in Britain for use on this journey. Before the “right-away” is given, time is available for a closer examination of the train. Next to the engine comes a long bogie chassis, with a van perched in the centre of it - a most curious-looking vehicle. As soon as the luggage-boxes have been salved from the hold of the Canterbury, they are dropped into position on both sides of the van, so hemming it in fore and aft. Both Pullman and sleeping-cars are found to bear, immediately under the roof, the lengthy and imposing inscription “Compagnie Internationale des Wagons Lits et des Grands Express Européens”, referring to the fact that they are owned by the International Sleeping Car Company, or “Wagons-Lits-Cook,” as the company has been known since its amalgamation with the well-known touring agency of Thomas Cook & Son. The Sleeping Car Company, which is responsible for Pullman, sleeping- and dining-cars over a large proportion of Europe, owns and staffs the cars, and pays a rental to all the railways concerned for running the cars in the trains. On the stroke of 2.30 pm the driver opens his regulator, and the “Golden Arrow” slowly makes its way round the curves leading off the quay. The characteristic shriek of a French locomotive whistle is heard frequently as a series of level crossings is negotiated. The train passes through the town station and the railway yards beyond. There is little chance to accelerate to any high speed, as immediately beyond Les Fontinettes the train begins to climb. For seven miles the engine has to mount an unbroken grade at 1 in 125 - exactly the same length and inclination as the steepest part of the southbound climb to Shap, the famous LMS summit in Westmorland - until the high downland behind Cap Gris Nez is at last breasted at Caffiers. This is a gruelling start with such a trainload and without assistance of any kind, but the powerful locomotive generally makes the whole ascent without speed falling much below the forty-miles-an-hour mark. Once over Caffiers summit, an average of over sixty miles an hour is maintained the whole way to Paris. Down from Caffiers the acceleration is rapid, but if the speed is timed from the kilometre posts, it will be found that when about seventy-five miles an hour has been reached, the rate keeps steadily at this figure, instead of mounting into the “eighties”, as it would probably do in Great Britain. This is because French railway speed - except that of high speed rail cars - is limited by law to a maximum of 120 kilometres an hour, which works out at 74.6 miles an hour. The driver knows exactly when his limit has been reached by the fact that every express locomotive in France is fitted with a speed indicator. The indicator is self-recording, which means that throughout the journey the mechanism records on paper the varying speed of the train. The record, with which the driver is unable to tamper, shows the exact speed at which he has taken his train round every curve on the journey. This matter of self-recording indicators on locomotives is one in which the French are considerably ahead of British railways. 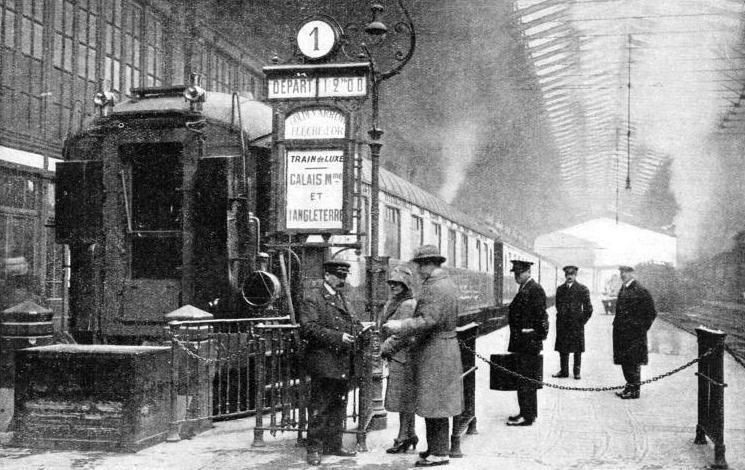 The “Golden Arrow” arrives at the Gare du Nord at 5.40 pm, six hours and forty minutes after its departure from Victoria. This photograph shows the train which leaves Paris for Calais on the return journey. After having passed through a series of tunnels and the Tintelleries Station at Boulogne, the Outreau curve is reached. Even if the speed here should be fifty miles an hour, the traveller need have no fear, as it is possible, with the safeguard of the speed record, to fix the limits on curves at the full figure that they will safely bear. At the Bifurcation d'Outrean, or Outreau Junction, the line from Boulogne Quay and Town Station is joined, and 156 miles of first-class high-speed track now lie between the train and Paris. A NORD “SUPER-PACIFIC” FOUR-CYLINDER COMPOUND LOCOMOTIVE hauls the “Golden Arrow” on the 184 miles non-stop run from Calais to Paris. All the numbers of these “Pacifics” start with the figure “3”, indicating that the engine concerned has three driving axles coupled. There is a short climb beyond Boulogne to a summit point near a station called Neufchatel, after which comes a swift descent to Etaples, where speed is moderated to about sixty miles an hour for the long curve which sweeps through the station. Now follows a stretch of line which is practically dead level for fifty miles. Here the wonderful tractive effort of these Nord “Super-Pacifics” is shown to its fullest advantage, It is nothing unusual for the “Golden Arrow” to be whirled over this level stretch at seventy miles an hour, notwithstanding the 600 tons of the train. Only through Abbeville, where again a curve demands slight moderation, is there any fluctuation in the speed. As Amiens is approached, speed is quickly reduced until it is down to fifteen or twenty miles an hour, for a severe curve is met. Eighty-one miles of the journey still remain. At Amiens the direct line to Laon, Belfort, Basle and Switzerland is left; and at Longueau, three miles farther on, the busy main route from Lille and Arras to Paris is reached. From here there is a steady climb to a third summit point, at Gannes, but the locomotive makes light of these 1 in 250 and 300 gradients, and although they are steeper than the LMS ascents to Tring, the 600-ton train is whirled up them at about a mile a minute. Descending from Gannes to Creil, the “Golden Arrow” slows slightly over the Creil junctions, where there comes in from the north the main route over which the principal Nord feats of speed are performed. The final climb of the journey lies ahead. Mounting past Chantilly to the fourth summit, at Survilliers, this time up a continuous 1 in 200 gradient, equal in inclination to that of the LNER main line from Wood Green up to Potter’s Bar, the locomotive maintains fifty to fifty-five miles an hour; and then a final seventy-five-miles-an-hour dash carries the “Golden Arrow” down through the outer suburbs of Paris to St. Denis. All the signals at the lineside are “repeated” audibly in the driver’s cab, as is done on the English Great Western Railway; but with an additional safeguard-the driver, immediately on sighting a signal at danger, must press his “vigilance button”, so making a mark on his speed diagram, and anticipating the working of the apparatus that would automatically apply his brakes unless the signal has changed to “clear” when the train reaches it. At 5.40 pm, The “Golden Arrow” rolls proudly into the Gare du Nord at Paris, depositing its passengers in the French capital six hours and forty minutes after their departure from Victoria. A big Nord tank locomotive is attached to the blue sleeping-cars at the rear of the train, and a few moments later they are once again outward bound. They travel nearly as far as St. Denis, but then diverge round the eastern suburbs of Paris until they can get down on to the PLM system, and so into the Gare de Lyons, where the PLM Company will take charge of them. Next day another set of sleeping-cars will make its way back by the same route into the Gare du Nord, soon after eleven in the morning, and after some manoeuvring will be attached at the head of the string of Pullmans which is already standing at No. 1 platform. At ten minutes past midday the northbound “Arrow” receives the “right-away”. Calais is reached at 3.15 pm, the summit at Caffiers having provided the last gruelling obstacle to the hard-worked locomotive. Ten minutes later the ordinary express for first- and second-class passengers, which has followed ten minutes behind the “Golden Arrow”, runs into the Gare Maritime, and fifteen or twenty minutes suffice to transfer the passengers and their baggage on to the Canterbury. Shortly before five o’clock the steamer berths at the Admiralty Pier, Dover; a “Lord Nelson” locomotive is waiting on the quay with the truck for the luggage-boxes; and at 5.25 the English “Golden Arrow” is leaving Dover for London, where it is due at 7 pm. “LORD NELSON”, LOCOMOTIVE No. 850, the first engine of a class of that name, is one of the most powerful express engines on the Southern Railway. This picture shows No. 850 on a single track near Petts Wood, Kent, near the junction with the old South Eastern and Chatham Railway’s main line. “HOWARD OF EFFINGHAM”, LOCOMOTIVE No. 854, another famous engine of the “Lord Nelson” class, is here shown hauling the “Golden Arrow” through Bickley Station in Kent. You can read more on “The Fleche d’Or”, “The Atlantic Coast Express” and “The Story of the Southern” on this website.